A fund to create a statue of Nelson Mandela, which will stand in Trafalgar Square, is being launched by London Mayor Ken Livingstone. The Madela Statue Fund hopes to raise £400,000 to create and erect the piece. Ian Walters, the artist who created the bust of the former South African President on the South Bank, has been asked to make the full length statue. The bronze cast will be placed on a low plinth on the new pedestrianised north terrace of the central London square. The fund was initiated by the late South African newspaper editor and anti-apartheid activist Donald Woods. It is now being led by his wife Wendy and Lord Attenborough. 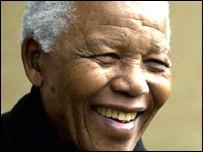 Mrs Woods said: "Donald saw the statue as a tribute from the people of Britain to the liberated people of South Africa. "It will also represent a salute to a global figure in a global setting." Mr Livingstone is supporting the planning and technical aspects of the project. He said: "The special relationship Mandela developed with the British people through the long years of struggle against apartheid make it absolutely fitting that his role in world history should be commemorated in one of the most important and symbolic public spaces in London. "I am determined to do everything I can to make this happen." The fund is being launched at a reception at City Hall on Monday night.